Something new! 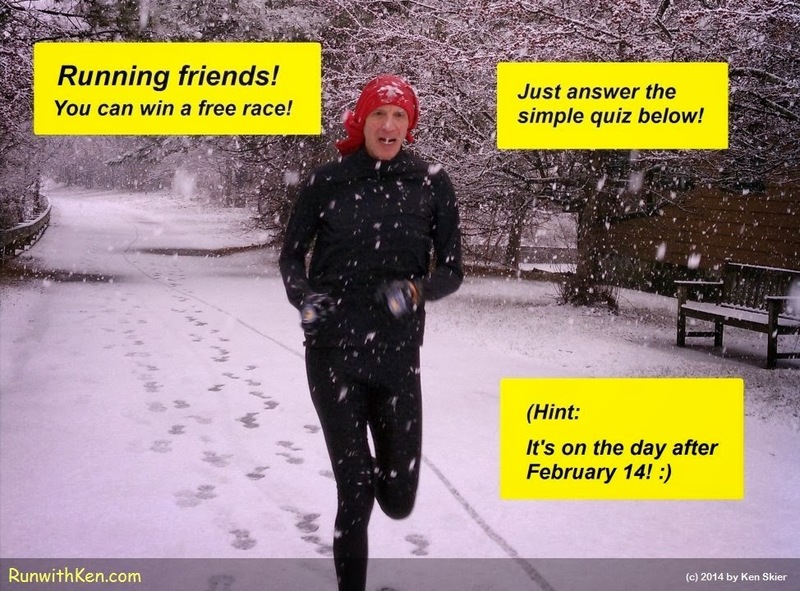 Enter this quiz...for a chance to win a FREE Race Entry! Thank you for choosing to Run with Ken on so many races! and Open Water Swim Races! So now I want to invite you to something new. On February 15 I will run a new race. I have never run a race of this type before. But I'm looking forward to it! that I can invite one of you to join me! February 15, in Malden, MA, as my guest. But you have answer a question first. Each entrant gets ONE chance to enter this quiz. Only one entrant will win. So hold back. Think this through. I have run hundreds of races in recent years. But there is ONE kind of race I have NEVER run! run this upcoming race with me. (Hint: This race is on Feb 15. Then enter your best guess in a comment below. received by 11:59 pm EST on Friday, February 7. (P.S. The winner won't have to run with me. Maybe you're faster than I am. Maybe I'm faster than you. Just run as fast as you can! I'll run as fast as I can. totaled to give us a team score. umm....ist it Valentine's day themed race? Just a guess....! If the correct answer isn't an Olympic-distance open-water swim from Hopkinton to Mt. Washington at Halloween, then I'd guess a Valentine-themed race! valentines day themed race is the answer. strange how my "post" from a few days ago via my iphone never actually processed. got your cupid wings ready Ken? Friday Funnies: A Fitness Tip from New England!